Coworking is when individuals and small teams share a communal workspace. 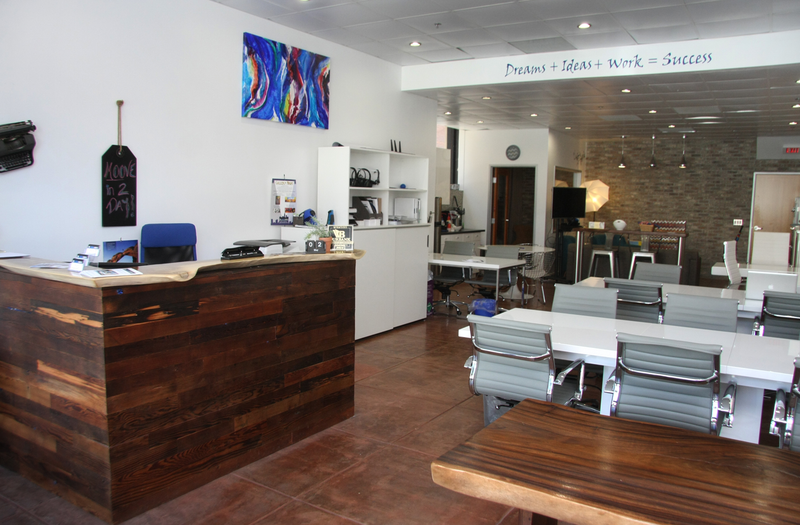 Our workspace includes shared tables, dedicated desks, and a comfortable lounge area. We also have two call rooms, for when you need some privacy. Our community of clients believe in productivity, connectivity, and inspiration. Coworking is ideal for individuals and teams looking to collaborate and innovate. The best ideas come from talking with people who have different a expertise than our own. Sharing ideas and experiences help us make connections and bring new ideas into our work. Our central location in Downtown Burbank provides a coworking environment where professionals from a range of fields come together to build their businesses. Our coworking space is friendly and inviting. We emphasize creating a work environment that comfortable, welcoming, and conducive to getting work done. Our services and amenities provide all the comforts of a dedicated office space for a fraction of the cost. Our staff is on-hand to answer any questions you might have, and to make sure you get the most out of the coworking life. We offer a range of coworking packages and pricing plans. Whether you are looking for a full-time workspace, a change of scenery for a few days a month, or just a single day of productivity, we have a package for you. Custom plans are also available, so please contact us for more information and to discuss your specific business needs. Ready to give coworking a try, and see if My Other Office In Burbank is right for you? Sign up for a free day pass, and come on down!